Click below to browse our various albums. Sometimes, to learn something new, you have to be willing to get your hands dirty. For members of the UR Baja SAE team, that’s a serious understatement. Beyond the grease and grit of building a mini Baja car, (think low-slung dune buggy, made for dirt and mud more than sand) designed and fabricated from the ground up, there is the testing and racing of the vehicle, which usually leaves the participants covered with something between a thick layer of dust and dirt to a full coating of caked-on mud. You won’t hear anyone complaining though. Judging by the enthusiasm with which they take on the task, the long hours in the shop and the sheer enjoyment of racing, it’s the sort of assignment that every engineer relishes. Teams from colleges and universities around the world compete every year, each of them designing the car around a common engine type, with certain parameters and rules for the assembly of the vehicle. Beyond that, it’s up to each team to figure out the best way to engineer a vehicle that will withstand the rigors of the track. Once built, a car must be thoroughly tested and meet certain inspection requirements at competition. 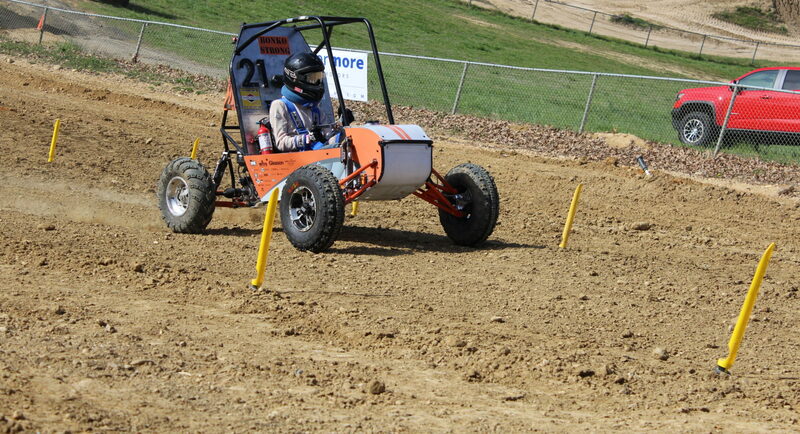 Teams are challenged to particular tasks such as hill climbs and obstacle maneuvering, but it’s the final day of competition, the four-hour endurance race, that often decides how each team will place. The goal is to get around the track as many times as possible within the four hours, dealing with mechanical issues and breakdowns in the process. While the team is primarily made up of mechanical engineering students, there are also students from other engineering disciplines from electrical and computer engineering to biomedical, not to mention the business students who work on the finances, sponsorship, and marketing of the team. It’s a truly collaborative and interdisciplinary learning experience and one that takes place entirely outside the classroom. And yet, the skills and knowledge that the students draw from, go right back to their curriculum. As they build on what they have studied with the practical application of skills ranging from welding to force analysis, it adds a new wrinkle to their education, going beyond just book smarts. It’s the sort of experience that has led many students to other opportunities, signifying certain abilities and aptitude to potential employers. Beyond the skill-building and the doors that it opens, at the end of the day, most students would say the biggest reason to get involved is that it’s just plain fun. Sitting in a classroom isn’t usually the sort of activity that gets the adrenaline pumping or the blood rushing, but when applying the knowledge learned there on the dirt track of a Baja competition, the sky is the limit.